"Our faith is our strength"
Tristan da Cunha is a group of remote volcanic islands in the south Atlantic Ocean and also the main island of that group. 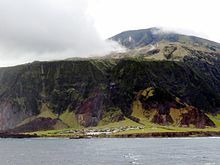 Tristan da Cunha is the most remote archipelago (group of islands) and the most remote inhabited archipelago in the world; it is at 2,816 km (1,750 mi) from the nearest land, South Africa, and 3,360 km (2,088 mi) from South America. The climate of the islands is temperate and oceanic, with a mean air temperature at sea level at Tristan of 15 °C (59 °F), with relatively small daily and seasonal variation. On Gough it is a few degrees colder. Rainfall is high: 1700 mm annually at the Tristan Settlement, and 3300 mm at Gough. Strong winds are common. Mean wind speed is about 40 km/h. Wind speed increases strongly with altitude, while temperature decreases. Thus, while the lowlands experience quite pleasant weather, the uplands may be covered in snow or battered by very strong winds. The average temperature for the year in Edinburgh of the Seven Seas, with an elevation of 23 m, is 13.9 °C (57.0 °F). The warmest month, on average, is February with an average temperature of 17.8 °C (64.0 °F). The coolest month on average is August, with an average temperature of 10.6 °C (51.0 °F). ↑ 1.0 1.1 1.2 "Tristan da Cunha - Summary". Global Volcanism Program. National Museum of Natural History - Smithsonian Institution. Retrieved 11 May 2013. 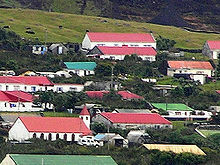 ↑ 2.0 2.1 2.2 2.3 2.4 "Tristan da Cunha". UKOTs Online Herbarium. UK Overseas Territories Science Team, Royal Botanic Gardens, Kew. 2011. Retrieved 11 May 2013. ↑ Rosenberg, Matt. "Tristan da Cunha: The world's most remote island". About.com. Retrieved 9 May 2013. ↑ 4.0 4.1 "The St Helena, Ascension and Tristan da Cunha Constitution Order 2009". legislation.gov.uk. Retrieved 1 May 2013. ↑ "St Helena, Ascension, Tristan da Cunha profiles". BBC News - Africa. 9 December 2011. Retrieved 10 May 2013. ↑ 7.0 7.1 7.2 "Tristan History 1506 - 1817". Tristan da Cunha Government and the Tristan da Cunha Association. 2006. Retrieved 10 May 2013. ↑ 8.0 8.1 "Saint Helena (U.K.)". World Statesmen.org. Retrieved 10 May 2013. ↑ 9.0 9.1 Carroll, Paul (2003). "Tristan Da Cunha - Discovery". Archive.org. Retrieved 10 May 2013. ↑ Roberts, Edmund (1837). Embassy to the Eastern Courts of Cochin-China, Siam, and Muscat. New York: Harper & Brothers. p. 33. ↑ 11.0 11.1 "Settlement of Edinburgh, saint Helena - Köppen Climate Classification". Weatherbase. Retrieved 7 May 2013. ↑ Almut Nebel; Bharti Morar; Trefor Jenkins (2003). "Genealogy and genes: tracing the founding fathers of Tristan da Cunha". European Journal of Human Genetics 11: 705-709. doi:10.1038/sj.ejhg.5201022. http://www.nature.com/ejhg/journal/v11/n9/full/5201022a.html.